Beyond infinity, I think that’s roughly where I’ve been recently. Or maybe I’m just in a major Disney mood…either way, I’m back! I think. It’s been a rough couple of months around here. Transitioning through the end of the school year for G (harder on A than on anyone else) and handling therapy scheduling changes for A at the same time has really taken its toll on me. As a result many things have suffered including my writing, eating, breathing, ability to carry a coherent thought, and sleeping. Yes, the rumors are true. It is possible to sit down and immediately fall asleep without realizing it until many hours later when you wake up in a very uncomfortable position that should not be humanly possible on the couch. This particularly annoying development has led me to conclude that no matter how much I may want to write, the rest of me has other plans that center on a close, detailed observation of the inside of my eyelids. And I was tired of waking up to random letters strung together on the screen that clearly indicated my pathetic and entirely useless attempts to write while no where near coherent. Still with me? Good. I’m lost already. Where were we? Well, A has made some minor progress with eating. She has recently updated her menu to include cinnamon & brown sugar Pop Tarts (and yes, they have to be the brand name ones) along with banana bread (no toppings and at room temperature only thank you very much). Little bits, but it does allow me to get a little more creative with her meals. 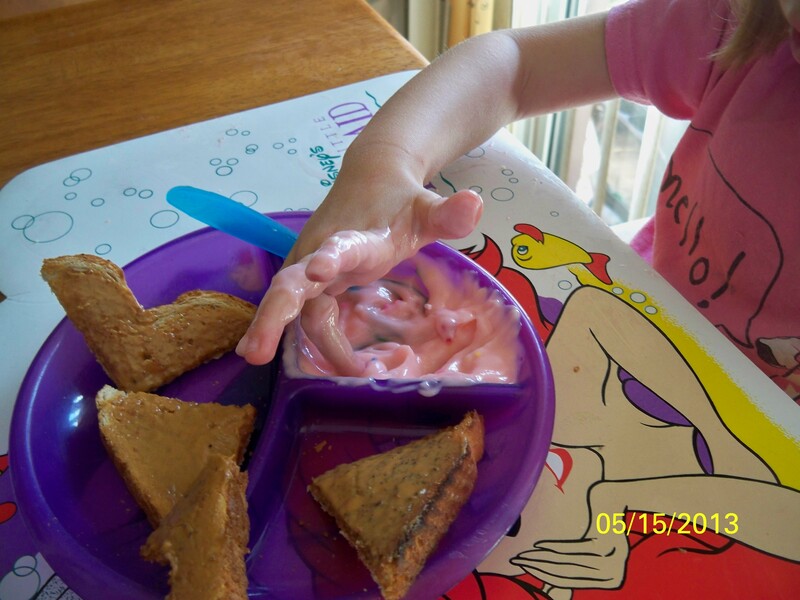 She tolerates both preferred and non-preferred foods on her hands (sometimes) now, which is a big step forward. I still don’t think we could live without yogurt. That and PediaSure are still my life savers when A is having a really bad day. Her “bad days” are fewer now than what she used to have, but when she has one it tends last for a few days. Not fun for any of us. Recently she had a bad week that I think was harder on me than on her. About a month ago A had a week where her body sense was so off that she could barely negotiate a playground we had been going to almost every day. Normally she would take off and run and climb without too much trouble. This particular week, she was crawling just to make it up 3 (yes three) small steps to get onto the equipment. It was so hard to watch her struggle. Most mornings we had the place to ourselves, but one morning there was another little girl A’s age at the playground. A was eager to play with her (yay for improved socialization!) but was still unable to negotiate the equipment without crawling. I stood back and watched to see if A would follow the other girl up or just stay on the ground where she felt more secure. A started to crawl up the steps while the other little girl bounded up them without holding on to a thing. This is hard to write about. It’s been a little over a month but I still have trouble writing or talking about this because in a way it still hurts. More so than I’d like to admit. Seeing the other girl make it up the steps and across the platform with no hesitation, A realized she was different. That one moment on that one day, she became aware she wasn’t like every other kid on the playground. I could see it in her face, in her eyes and it hurt. I wanted so badly to scoop her up and take her home. To protect her in a way. It took everything I had to stay standing off to the side and let A decide what to do. A decided not to be left behind. She grabbed on to the railing and pulled herself upright and fought for every step to make it up the stairs and across the little platform to where the girl was standing and waiting for her. A held onto the railing like it was the only thing keeping her upright (and I think it was) and pulled herself along one slow, careful step at a time. It was so hard to watch but also so wonderful at the same time. My little girl didn’t give up. She fought to keep up and not be left out and she did it. She was exhausted when we left the playground 20 very long minutes later but she did it. As hard as it was to watch her struggle and as much as it hurt watching her realize she was different, I am so proud of her and I know that she’ll be okay in the future. I don’t know how this new awareness has affected her since she doesn’t have the words yet to tell me, but it doesn’t seem to have dampened her spirits at all. We can only go forward from here and as we do I pray that A can continue to face whatever comes her way with the same courage and determination she showed on the playground that morning. In the meantime, I’m off to a more comfortable place to sleep before I fall asleep at the computer! Yes, “bacweems” is a word, a really bad word in A’s language. For the rest of us, it means “vacuum”. Generally not something to cry over, but recently all I have to do is say vacuum and A is screaming. Yes, the noise bothers her that much. So why am I talking about vacuums? Mostly because I find her mispronunciation incredibly cute and hilarious, but also because it’s rather fresh in my mind right at the moment. I mentioned this morning that the house needed a good vacuuming and just like that, her day was ruined. At least until I took her to the playground after dropping my son at school. The playground has been my lifeline recently. I discovered 2 weeks ago that taking A to a playground before or after therapy (depending on time) made a huge difference in her behavior. She was able to get the input she needed and run the wiggles out all at once. It has also resulted in a major increase in her appetite, which is always fantastic! Another plus is that I am getting a whole lot more exercise than I used to and can now run a mile without feeling like I’m going to pass out (haven’t done that in number of years). Of course, I’m still passing out at night right after that kiddos, but at least I’m making it through the day now! It’s amazing to watch A navigate a playground effortlessly one day and the next day notice that she can barely manage the steps at the same playground. Times like that I realize just how difficult things must be for her day to day, and yet, she just bravely pushes on and keeps going. Her new thing, when she is having difficulties, is to constantly say, “I can do it! I can do it!” until she completes whatever she’s trying to do. And yes, we do celebrate when she does whatever she was trying to do, even it’s just climbing three steps. The Little Engine that Could doesn’t have a thing on my kid. After making our daily trips to the playground, A not only eats better, but she’s sleeping better too. That’s been the biggest blessing for me. Getting back to regular naps and sleeping through the night have made a world of difference for all of us. Mind you, we weren’t exactly inactive before. My kids and I are very active people, but finding the right times and outlets for A’s needs took a bit of doing. It has gotten easier though as we have made progress in OT with her sensitivity thresholds. Speaking of progress, it continues with the sweet potatoes! It still may not seem like much to many, but A is semi-regularly eating about 2 tablespoons of sweet potatoes with minimal fuss as long as she is seriously distracted, and it doesn’t touch her lips, and I feed it to her. Sounds like a lot, right? It is. But soonish she’ll be able to feed it to herself without a problem and then we’ll move on to other things. In the meantime I will be single-handedly keeping my local sweet potato farmers in business for the foreseeable future. I’m sure they are doing happy dances as I speak…write…whatever it is I am doing right now. As much fun as this has been, my alarm has just rather loudly informed me that it is time to go get my son from school. Yes, I need an alarm to help me keep track of time when I’m writing otherwise I would probably be at it for another hour or so. And with that, life goes on and the playground beckons for one last visit before the week ends and the necessary weekend morning chores intrude on my fun. Guess I’ll just have to pull out the Disney music so we can dance while we clean! After all, a spoonful of sugar helps the medicine (and sweet potatoes) go down! Two weekends ago we enjoyed our annual Indy Car race. My wonderful hometown had the pleasure of once again hosting the opening race for the 2013 Izod Indy Car season. This was A’s second race and, in my humble opinion, it went even better than last year. Granted, A’s vocabulary is at least 10 times what it was this time last year, but she actually ate without a fuss this year. Yes, we were away from home and she still ate well. That never happens, even eating outside at home can throw this child off, but she ate surrounded by noisy cars zipping past. Turns out the cars were the explanation. For a child who has auditory sensitivity issues, the sound of the Indy car engines has a calming effect on A. I cannot even begin to explain it, but I’m not about to argue with it! As usual, I had packed food for the day that I knew A would eat (mostly yogurt and other “squeezie” foods), but she surprised me by munching on mini Nilla Wafers, bread (from my sandwich), and chips (her brother’s). She didn’t ask for the yogurt, she wanted the “chewy” foods (i.e. – stuff that actually requires chewing). That is such a change from her usual M.O. that I almost couldn’t believe it. Almost. Needless to say, this opens up a few more possibilities for local excursions. A has made remarkable progress in the past month. Since race weekend her speech has exploded. It has been amazing listening to her and realizing that not only can I understand her, but others can as well. I cannot even begin to describe how exciting it is. Honestly, unless you have the “been there, done that” shirt it’s hard to explain. The most remarkable bit of progress came just this past week though. A took 10, yes 10, bites of mashed sweet potatoes. Granted, they were “ant bites” (what we call really small bites), but she took them without a fuss or gag! The cause for this sudden progress? Her “snuggie” vest. In therapy we have been using a SPIO vest on A with amazing results. She calms down and can tolerate sensory input much better when she is wearing the vest. Unfortunately, the day that we are able to use the SPIO does not coincide with her feeding therapy so we had not been able to see if it had any effect in that area. A’s PT had recommended that we look for either a swim suit or a leotard one size smaller than A’s normal size. It would provide feedback similar to the SPIO (at a much lower price). After much searching, I stumbled upon a 2 piece swimsuit whose top worked perfectly. A has been wearing the top during the day since Thursday morning, and we have seen an amazing difference. 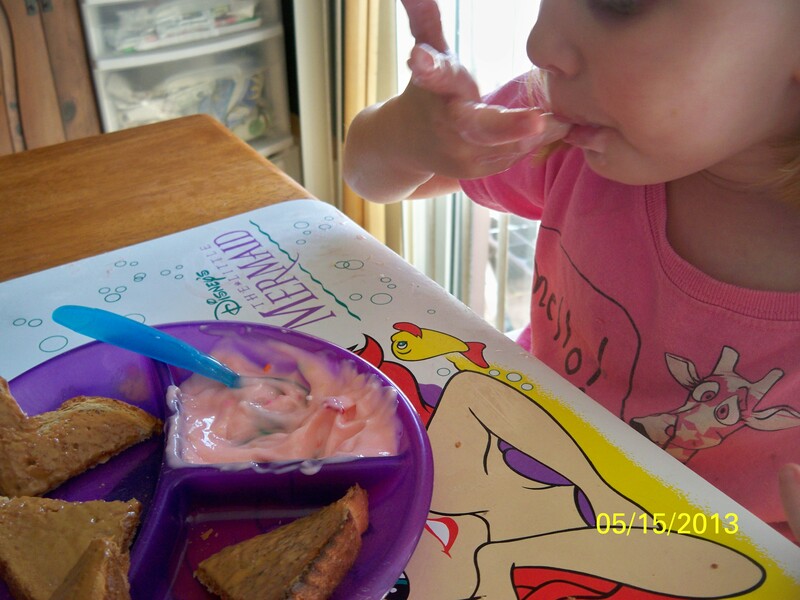 That night she sat at the table without a fuss, ate everything on her plate (peanut butter sandwich, applesauce, yogurt, and goldfish), and took the 10 “ant bites” of sweet potato in between her other bites. You could have knocked me over with a feather by the end of the meal. I could not believe the difference. That Thursday night was the first night we had been able to sit through a meal without A fussing, throwing something, or refusing to eat. It was beyond amazing to realize that she managed to sit at the table for 30 minutes straight and eat without a fuss. Yes, I did have to distract her a bit when it came to the sweet potato bites, but she didn’t shut down and refuse to eat after taking a bite. Even more amazing was that after dinner, she sat and colored with her brother and I was hearing her use full sentences with G when she needed his help with a marker or wanted him to shift over some. There was no screaming or hitting or crying. I still cannot believe the difference that one little size 18 month (yes, she is that small that I had to go down 2 sizes to find the right snug fit) swim top has made for A.
I have to admit to being almost giddy and weepy at the same time when I think about the difference this has made for A. I have, in the past 3 days, watched my amazing little girl cope with the world in a way she has never been able to in the past. A is now able to go to a playground without clinging to me because the other children overwhelm and scare her. She is willing to try new foods and happily sits through meals. Best of all, she is able to tell me when she needs her “snuggie” to help her cope with the world. Milestones is such a loaded word. Although, everytime I hear it I can’t help but think of the old (talking Roman Empire old), literal milestones that marked off the distance between two (sometimes more) points along the road. In our case, however, the milestones are figurative but the exhaustion real. I have been wanting to sit down and write for awhile now, unfortunately falling asleep roughly 30 minutes after the kids are in bed is not conducive to writing. We spent the first two weeks of this month getting back into school/therapy routine only to have it smashed to bits with IEP meetings and other oddball appointments. Meltdowns were frequent and sleep was rare. Generally not a fun time. I think the IEP meeting was the worst. Never attend one of those with a migrane, it only makes it worse. Two, yes 2, hours of going over reports and making decisions based on their short term observations of my child. All to get a plan for how a classroom teacher should handle her, what accommodations she needs, and what classroom setting will be best for A. I am so thankful that I made a point of learning as much as I could about A’s issues and the acronyms/jargon relating to it because I think they used it all in those two hours. Speaking of acronyms and jargon, I guess I should explain an IEP. In our school district (which needs its own IEP for a severe communication deficit), it stands for Individual Education Plan and is used for students that need to have extra services. In our case that’s speech and physical therapy with an OT option (sounds like a McDonald’s value meal – “I’ll have an SLP and a PT please.” “Would you like OT with that?”). It can also apply to children in a gifted program as well. All IEPs are handled by the ESE (Exceptional Student Education) department. And yes, they all love their acronyms. The upshot of all of this is that it was decided that A would receive speech and physical therapy during the morning in a pre-k setting with the option for occupational therapy to be add on later if the teacher felt there was a need for it. The downside of all this is that the half-day class they placed her in is not at the same school my son attends. The upside is that her school is only about 5 minutes from his, making it a bit more manageable. This was A’s first week there. She celebrated her birthday by spending the morning at school and the afternoon at therapy. Poor baby was completely wiped out by 4pm. She did have enough energy to blow out her candles and eat a bit of cupcake though. Now, before anyone gets their knickers in a knot about sending a 3yr old with her issues off to preschool and how it just doesn’t seem right, hear me out. A is an amazing and frequently difficult little girl. She is quite smart and creative and intensely curious when her sensory issues don’t get in her way. While I have done my best to provide a rich home life for her (and her brother) there are some experiences that I just cannot duplicate. This was not done on a whim. I spent many sleepless nights wondering if it was the right thing, wondering if it was too soon to place her in a structured classroom setting, and wondering if she would be able to cope with the busyness of a classroom with ten other preschool aged children. Sure, she can self regulate pretty well at home, but how would it work at school when she couldn’t go hide in her room or under her blanket when things got to be too much? Would she bite another child? Would she try to spend the day hidden underneath something? Would she eat? Would the teacher and aide be equipped to handle a child with A’s issues? Al those questions, along with a hundred thousand other questions danced ceaselessly though my head day and night. Honestly, even though I chose to go ahead and try it, as I left A’s classroom on her first day I still wasn’t sure if I had made the correct decision or not. Thankfully, so far, school seems to be working out for A. She likes her teacher and has fun. She even played in the sand table and swung on the swings voluntarily (I did have to ask her teacher if she was sure that was my child we were talking about). She looks forward to going and is a bit put out on the days she doesn’t go (program is a mornings only 4 day a week program). A has had some spectacular meltdowns after school, but I’m hoping those will diminish as we get the hang of this routine addition. There is one big plus to A being in school 4 mornings a week. I get “me time” a couple of mornings a week now. I decided to make the most of it and hit up the beautiful city park that is very close to the school. Besides having a beautiful walking/running/biking path around the lake, it has a free outdoor gym thoughtfully provided by the city. It’s amazing what an hour of outdoor exercise, with a few minutes of bald eagle watching thrown in (the park has a nesting pair in residence currently), can do for your stress level. I never realized just how exhausting taking care of her was until I had that little bit of free time. It’s not like leaving the kids with grandparents or other family for the day to go do something. It’s knowing that A is getting the therapy and structure and interaction she needs while I am able to get the downtime I need and it’s regular. I like knowing that no matter how bad a week might be, I will definitely be able to get at least 2 days where I have a little bit of the morning to recharge my batteries. Things are never black and white when it comes to these kinds of decisions. It’s hard with neuro-typical kids but harder when there are extra issues to consider. I’m still learning that sometimes you have to just hold your breath, cross your fingers, arms, legs, and hairs and jump. Sometimes things will turn out fine, other times, well let’s just say other times you’re wishing for a stunt double. Until then, I’ll be the glassy-eyed parent wearing a helmet! Christmas In Finicky Feeding Land! Yes, I know. Technically, Christmas day was 5 days ago, but I’m one of those who likes to celebrate the full 12 days of Christmas. And my kids don’t mind too much either. I think it’s because of the music and the food. After all, this is a season of amazingly good (and rich) food, and there is nothing easier to get a kid to eat than a cookie they helped to make. Especially when you’re dancing to music while you bake. Yes, it’s true, I let A help me with our Christmas cookies this year. Crazy? Probably. Worth it? Definitely. Let’s face it, you don’t get much more sensory intensive than mixing, rolling, and sprinkling cookie dough. Okay, so she didn’t exactly help with the rolling part, but she did touch the dough and was quite proud of herself for doing so. She helped squash them with the glass (great for the “heavy work” end of therapy). Yes, I kept a hand on the cup. Real glass and tile floors don’t play well together. Then it was time for sprinkles. Who doesn’t love sprinkles? Great for fine motor skills (hello pincer grasp!) and motor control (on the cookies not the baking sheet if you please!). Who knew baking could be so therapeutic? Of course, she had to find something to amuse herself for the 12 minutes it took for the cookies to bake and the 15 minutes it took for them to cool. Thank the Lord for puzzles! And, yes, she does those on her own. I wish I was making that up but my almost 3 year old is rather bright (not parental bias people, I have the assessments to prove it!). After all that hard work, it’s time for taste testing! With a nice cup of cold milk of course! Actually, she didn’t eat that cookie. A decided she wanted gingerbread biscotti instead so she fed her cookie to me. No complaints here! What’s that? She ate biscotti? My super picky, super sensitive child ate hard, crunchy biscotti? Yes, yes she did. Only it wasn’t that hard and crunchy. And there was white chocolate involved. While traditional Christmas dinner is definitely not A’s cup of tea, I have found ways around that thanks to the variety of seasonal foods that I love to make. Granted, her Christmas dinner consisted of a GoGo Squeeze (I don’t think I would survive without those), 2 herb rolls (homemade, time consuming, but very yummy), PediaSure, and egg nog. Yes, egg nog. We have discovered that A absolutely loves egg nog. How much? Well, she guzzles it; and I mean that in the truest sense of the word. She can down 4oz of the stuff faster than anything (sorry, the analogy portion of my brain has officially shut down for the night). Her favorite thing though, is “Crumbly Cake.” It’s actually called Railway Crumb Cake, but crumbly cake was easier for G to say when he was little, so the name stuck. It is one of the easiest things to make (I’ve been making it since I was about 9 years old) and it is so delicious. Another bonus is that it makes the house smell wonderful. Both my kids love helping, both with the making and with the eating. This has become my family’s traditional Christmas morning breakfast (we use it on Thanksgiving also) just because it is so easy. It takes about 30-35minutes to bake so you do have to plan ahead it you want it freshly made in the morning, but it is worth it. I haven’t seen this recipe anywhere since I read it in a Pockets magazine when I was 9 (yes, it was a while ago); so here it is if anyone fancies giving it a go. Combine the flour, sugar, and butter in a large bowl until mixture resembles crumbs. Set aside 1 cup of this mixture for topping. To the remainder of the crumbs, add the baking soda, cinnamon, cloves, and nutmeg. Mix well. Make a well in the center and add the egg and buttermilk. Stir gently until just combined. Pour in to a greased 9.5in pie plate and top the 1 cup of crumbs that was set aside at the start. Bake at 350F for 30-35 minutes or until a knife inserted in the center comes out clean. Let cool, then slice and serve. Serves 8. This was ours about 15 minutes after it came out of the oven Christmas morning. The kids wanted this before they opened their presents. I’d say it’s because they like it so much (which they do), but I think the real reason is they wanted to be able to play uninterrupted after opening presents. Suffice it to say, it’s always a big hit and A has actually been eating because of it. I would make it year round, but for me it really is a Thanksgiving/Christmas time only food. Guess I’ll just have to hunt down some regular crumb or coffee cake type recipes for the rest of the year! In the meantime, happy eating and even happier Christmas! Yes, it’s one of those weeks. A just doesn’t want to eat unless she can slurp it through a straw. What’s that? Yep, it’s the sound of my blender crying. I don’t think mine will make it to the spring; good thing they go on sale this time of year! Our family had a very quiet Thanksgiving. Like most people I talked to, half my household was sick (G and myself being the sick half) and A was just completely out of sorts. Her brother was not at school when he should be, her therapy schedule was, by her standards, completely upside down and inside out, and nobody was where they were supposed to be when they were supposed to be! According to her anyhow. Think my kid likes her routine? Yes, that was rhetorical. Moving on. We have since recovered from the traumatic schedule change and moved on to a semi-traumatic venue change for her weekly therapy. As of Thanksgiving, the office I had been taking A to for her speech and physical therapy closed. Thankfully, it was a satellite office so we didn’t have to find all new therapists and the main campus for the hospital is still fairly close to us. Let’s face it having to drive 10-12 minutes instead of 8-10 minutes is not that big of a deal, especially when it means access to a brand new facility. Yes, I like that part a lot. Unfortunately, A didn’t see things that way and was rather bent out of shape at seeing familiar faces where they didn’t belong. Lucky for me though, it only took her about a week to adjust to having her speech and PT at the main campus instead of just feeding therapy. OT is supposed to be in there too, but we’re on a waiting list that includes at least half the state I think. Okay, so maybe not that many people, but it does feel like that some days. Sorry. This is what exhaustion does to you. No, really. It’s actually a miracle I’m still awake right now. Normally once the kids are in bed I’m falling asleep by 7:45 or 8. Making it to 8:15 and not dozing is 100% miracle. Of course, the tornado warning that expired about 10 minutes ago might have something to do with it too. So, because of all the upheaval in her little life (and the phase of the moon, height of the tide, and direction of the wind at 3:28am on Saturday), A is not eating again. Actually, it has more to do with the fact that she is super sensitive right now. More so than usual. Her normally hyperactive gag reflex is in over drive right now and even her favorite solids (Grahamfuls, hamburger bun with peanut butter or plain, yogurt) are making her choke right now. I never thought I’d say this, but thank God for Pediasure. Since Saturday I have been walking a fine line between making all her meals liquid (giving up for now) and continuing to try the solids. So far, my logical side has prevailed (scary) and I am still offering her solids at each meal. Mostly she refuses, but sometimes she gets a bite or two down. If she starts gagging after that I don’t push it, but I at least want her to keep trying. It is not easy. In fact, you see that point farthest from easy? That’s where we are at the moment. We have had some triumphs. A was really cooperative in feeding therapy today and even managed to eat 1/6 of of her hamburger bun at dinner along with 1/4 of a Grahamful before she started gagging when the food hit her tongue. And for those who may ask, “Isn’t that just a behavior thing?” No, in this case it’s not. A genuinely hits a point when she cannot tolerate solid food on her tongue. She tries to take bites, or even nibbles, but she just physically cannot do it and I won’t push her. Hopefully, she’ll come out of this soon. If not, it will just force me to get creative and there is nothing wrong with that. In the mean time, we’ll just do lots of creative art/therapy type projects that result in inexpensive and nifty little Christmas gifts for people. For how that works out, you’ll just have to stay tuned! Yes, I know, not a very original title. I’m sure we’ve all heard it a “bazillion times” (to quote my son) and are tired of it. But coming up on Thanksgiving tomorrow, I realized that I no longer reserve my “what I’m thankful for this year” reflection to one day. Every day I find at least one thing I’m thankful for, no matter how small. Sitting here this evening, putzing around on Facebook, I realized just how big those daily small things really are. This year, I am beyond thankful for A’s progress so far. We have struggled to get her weight up and managed to succeed. Yay! No G-tube needed! We have fought to get her muscle mass built up, and are making amazing progress. Plus, all those trips to the playground and chasing after her on her tricycle are great for Mama too! I never knew you could run a mile without leaving your own block! Amazing. A is talking in small sentences (2 to 3 words) more often than not, she is engaged in the world around her (most days), and is just an absolutely amazing little girl. Yes, that is my parental bias speaking, but I’m sticking by it! G is an amazing big brother and little boy. I won’t be able to call him that much longer as he turns 7 next month and is quite insistent that he is a “big kid, not a little boy!” Despite all, he is caring, patient, and kind to his sister. He helps her when she struggles and is endlessly patient (for an almost 7 year old) when she falls apart and lashes out at him. Now, I’m not saying they don’t fight. Believe me they argue and antagonize each other on a daily basis, but there is not a deliberate maliciousness to it. It’s more of a I-want-to-see-how-far-I-can-push-this sort of thing and they resolve it fairly quickly and usually without needing me to step in (thank goodness!). Tomorrow, while we’re all enjoying our Thanksgiving PB&J, yogurt, graham crackers, and Pediasure….wait, sorry, that’s A’s menu. While we’re all enjoying our Thanksgiving turkey, stuffing, cranberry sauce, assorted veggies, rolls, and pies, let’s take a minute to remember those out there that may have a harder time finding a small moment each day to be thankful for with their children with special needs. Maybe the one’s whose progress can’t be measured yet, or who have just received a diagnosis and have no idea what their future holds or it they will be able to make it through each day. Let’s remember that while some of us may be lucky enough to have coverage for therapies, be it Medicaid, Medicare, or private insurance, not everyone has that luxury. Some families are left with no resources and no idea where to turn or what to do. Let’s take a moment to remember those families too. After all, we can’t always see the heartache and struggles people go through until we take a moment to look a little closer and open our hearts a little wider. I hope this Thanksgiving Thursday, whether you live in the US and celebrate it or not, you find at least one reason to be thankful for what you do have and not what you wish you had. March: Madness, Miracles, and Mayhem!